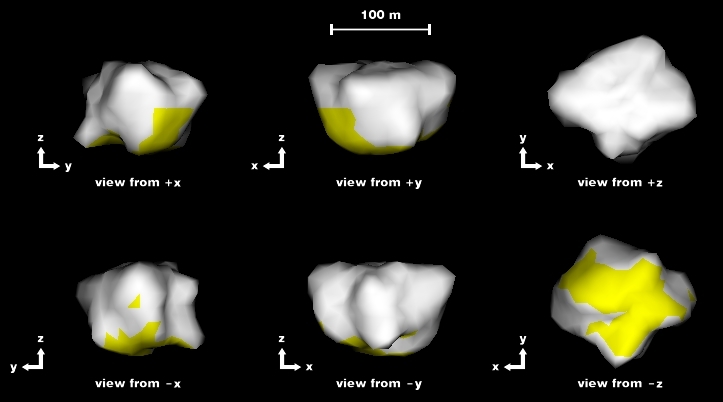 Radar and optical observations of asteroid (54509) YORP provided the first direct observational evidence that sunlight modifies the spin of asteroids. The International Astronomical Union announced the asteroid's name on 2007 April 2. The YORP work was published in two separate papers in Science in 2007. P. A. Taylor, J. L. Margot, D. Vokrouhlicky, D. J. Scheeres, P. Pravec, S. C. Lowry, A. Fitzsimmons, M. C. Nolan, S. J. Ostro, L. A. M. Benner, J. D. Giorgini, C. Magri. Spin Rate of Asteroid (54509) 2000 PH5 Increasing due to the YORP Effect. Science 316, 274-277, 2007. S. C. Lowry, A. Fitzsimmons, P. Pravec, D. Vokrouhlicky, H. Boehnhardt, P. A. Taylor, J. L. Margot, A. Galad, M. Irwin, J. Irwin, P. Kusnirak. Direct Detection of the Asteroidal YORP Effect. Science 316, 272-274, 2007. An image showing a rendering of asteroid 2000 PH5. The shape model was obtained by inverting high resolution radar images of the asteroid obtained at Arecibo and Goldstone. 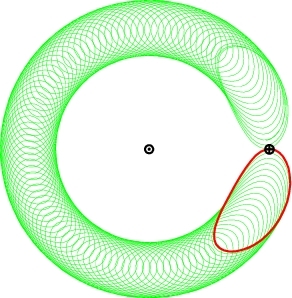 The shape model is published in the Taylor et al. (2007) Science paper. A movie showing a rendering of asteroid 2000 PH5 as it spins on its axis is available in small and large formats. This is based on the radar shape model published in the Taylor et al. (2007) Science paper. A movie showing the trajectory of 2000 PH5 against the background stars can be found here. This is based on the optical data published in Lowry et al., Science 316, 272-274, 2007. (Movie credit: Stephen Lowry, Queen's University, Belfast). Evolution of the position of 2000 PH5 in its Sun-Earth horseshoe orbit shown in a frame co-rotating with Earth. As the asteroid reaches alternate ends of the horseshoe every 100 years, it gravitationally bounces off Earth and reverses direction. The Sun is marked with (.) and the Earth is marked with (+). The 2003 trajectory is shown in red. 2000 PH5 is a near-Earth object with an orbital period extremely similar to that of Earth. For the past ~100 years it had been trailing Earth while slowly catching up at a rate of about 3 degrees per year in mean longitude. The asteroid recently reached one end of its horseshoe orbit and underwent an abrupt change in orbital parameters. Earth's gravity increased the asteroid's orbital energy, such that the semi-major axis changed from its former value of ~0.994 AU to a value of ~1.006 AU. The asteroid will now recede at a rate of about 3 degrees per year in mean longitude, until it reaches the other end of the horseshoe, 30 degrees ahead of Earth, almost 100 years from now.